NEWS: Please visit the website EczemaQnA.com for all information to buy, review and learn about my book Living with Eczema : Moms Asks, Doc Answers! Living with Eczema is a book co-authored by Mei aka MarcieMom and Professor Hugo van Bever (who is the doctor for Marcie, Mei’s daughter). It has close to 200 pages of practical advice, explaining eczema – its diagnosis, treatment, prevention and research, including an unique section MarcieMom Asks, Prof Hugo Answers in each chapter. Subscribe to the newsletter for more updates from Mei! A to Z Animals are not scratching! 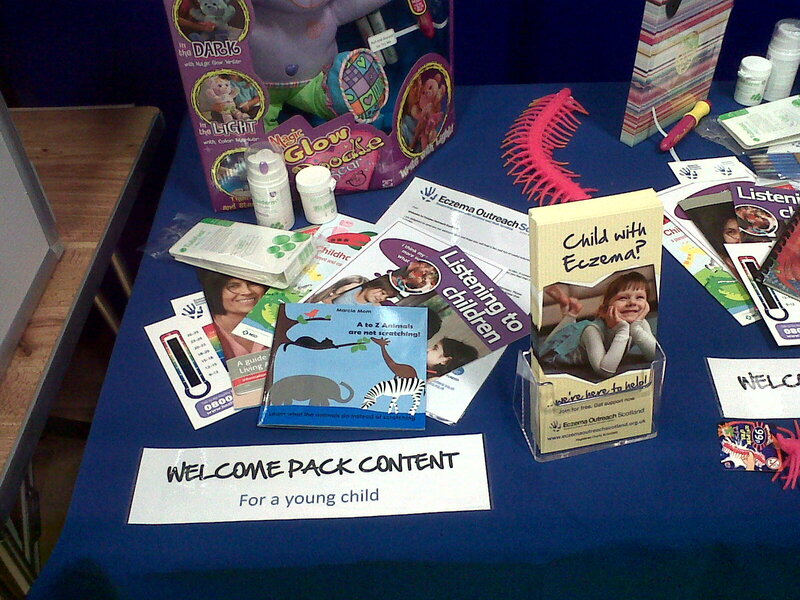 This is a book that offers an ingenious, light hearted approach to teaching young children not to scratch. It is inspired by my baby girl, Marcie, who has eczema since 2 weeks old. 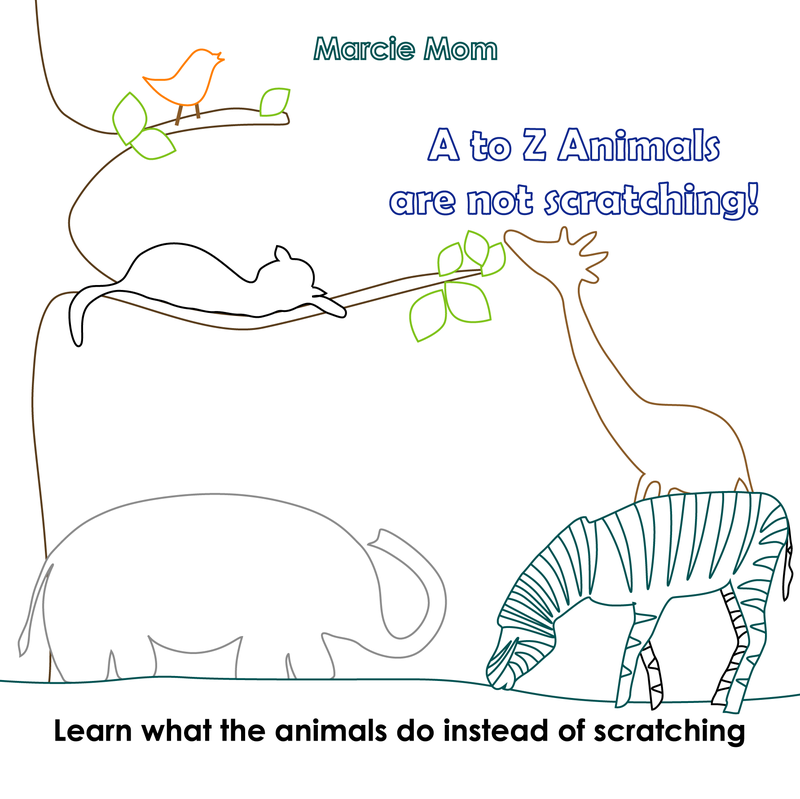 I wish that it will be in print one day (currently available as ebook) IT IS PRINTED so that all children, particularly those with eczema, can have fun learning not to scratch just as the A to Z animals are not scratching! This book is beautifully illustrated on Adobe Illustrator and each animal (26 in all, A to Z!) is doing something and not scratching when faced with various conditions such as heat, itchiness, fatigue or sleepiness. You can preview sample pages (A to D animals)below. Update Aug 2012: My book is PRINTED! I’ve 250 copies, and they are running out fast! Update June 2013: The book has completely run out – if interested to purchase, do let me know so that I can print another batch! Update March 2014: I have re-printed the book due to popular demand, contact me for bulk order or to send as a gift to a young friend with eczema. 2) 30 copies to Columbia Academy, a Singapore preschool 3) 20 copies to National Skin Centre 4) 32 copies to Singapore’s National Library (available for loan! ), and the rest sent all over the world! Elephant is itchy but not scratching! Kangaroo is tired but not scratching! Zebra is thirsty and not scratching! Thanks Kristina for letting me know, I didn’t realize that epubbud.com had closed; I would email you separately to work out the logistics! Please could I also receive a copy of this link to buy the books! There’s no where that you can buy the A to Z Animals, I’d email you to see if you’d like the hard copy – I can send it over for just the cost of printing and postage. I would love to get a physical copy of the book. Please let me know how I can get a copy. Which book would you like? Be emailing you, have a good day! Mei, your book looks great! I am a big fan of your site! It has helped me cope with my daughter’s eczema. She is now just over 2 years old an has had eczema since she was 4 months old. Although it has abated somewhat, she still itches sometimes and has made scratching a habit whenever she is tired, upset, or sick. I think your book would help her kick the scratching habit. How do I get the printed copy of it? Will let you know when the book is out! You can fill in the above form and if you like your daughter’s picture to be in the book, submit your photos and my co-author will do the selection depending on whether it fits into the relevant sections. Last time, I saw the e version. I want the real book, Mei. Can I ordered the printed one? Oops, it ran out! (just) If only you’re in Singapore, cos it’s available in the library! How can I purchase a copy for your book? My 4 year old boy has had eczema since two months of age and I’m fighting his daily scratching episodes. He loves books and I would love to share yours with him. Thanks! I would love to get a physical copy of the book as I like to keep looking at screens to a minimum for my baby and he has had bad eczema since he was just a few months old (about to turn a year soon). Please let me know where or how I can get a copy – it’s such a great idea. Would love to have a copy if it’s available. My daughter has ezcema n food allergies. Would love a copy of your book if not a hassle. My 2yr old little girl has eczema and I’ve been trying to explain to her the importance of not scratchIng but it’s just so hard. What a great idea! You have a lot of talent and a beautiful daughter.